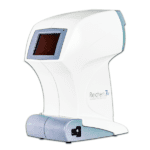 Clement Clarke Perkins MKII Tonometer - Vision Equipment Inc. The Perkins hand-held tonometer has been established for well over 20 years as a “world standard” for hand held applanation tonometers. Goldmann Standards Based on Goldmann principles and utilising the original Goldmann or Tonosafe disposable prisms, the Perkins combines proven technology with the flexibility of a hand held instrument. 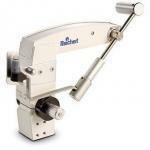 Versatile and Accurate Tonometry In busy clinics and practices with limited resources, there are times when a hand-held applanation tonometer is more convenient and cost effective for examining multiple patients. Combined with convenience and versatility, the Perkins offers proven accuracy and brilliant visibility. Precision counter-balanced movements allow reading to be taken with the patient in any position. 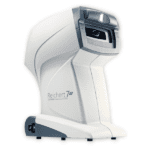 The illumination system provides superior fluorescein, greatly enhancing the familiar “semi-circles” which are vital to attaining accurate results. Every Perkins Tonometer is calibrated to the highest quality standards and comes with a signed and dated Certificate of Accuracy. Examine at Arms Length The optional Perkins Examination Telescope (P.E.T.) allows magnified viewing of the fluorescein “semi-circles” at arms length, making examinations more comfortable for both the ophthalmic professional and the patient. And because the P.E.T. also makes it possible for two people to view simultaneously, it can be used as an effective teaching aid. 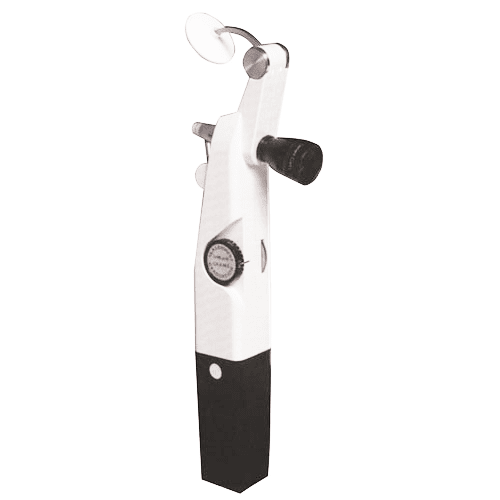 Accessories The Perkins Tonometer comes standard with a lightweight, compact carrying case, Goldmann Prism and battery operated handle taking four AA size batteries. Accessories include a rechargeable handle and recharging unit and Tonosafe disposable prisms.